Need a hearty, quick dinner recipe? 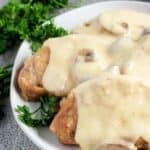 Then check out or Instant Pot pork chops with mushroom gravy. 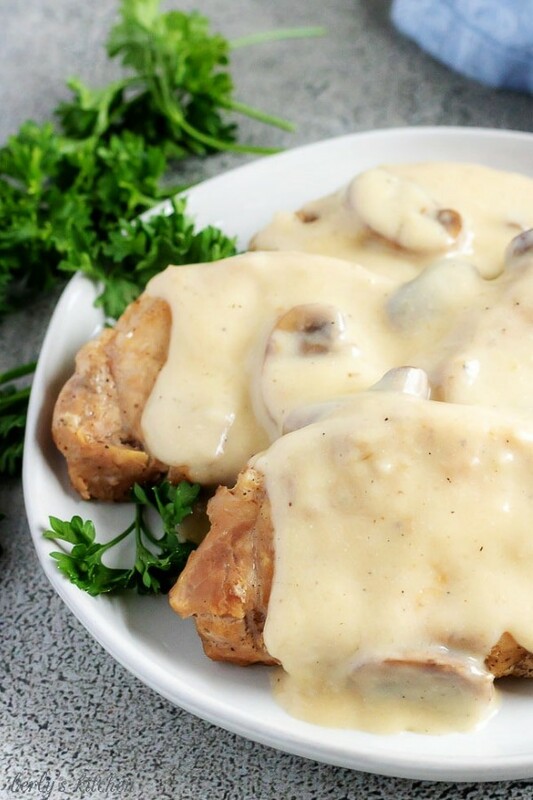 Boneless center cut chops served with a savory gravy. 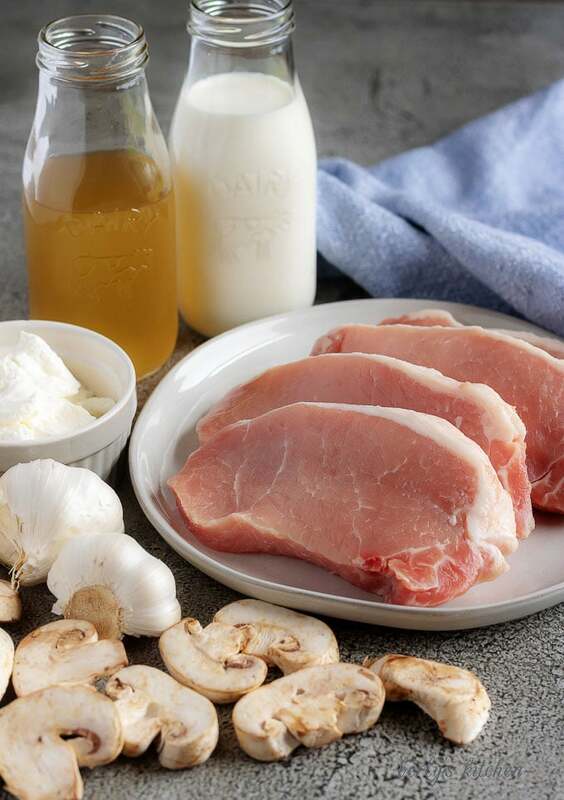 Pork chops have been a family favorite for years. However, this is the first time Kim and I have ever shared a pork chop recipe. So, you know we wanted it to turn out properly. 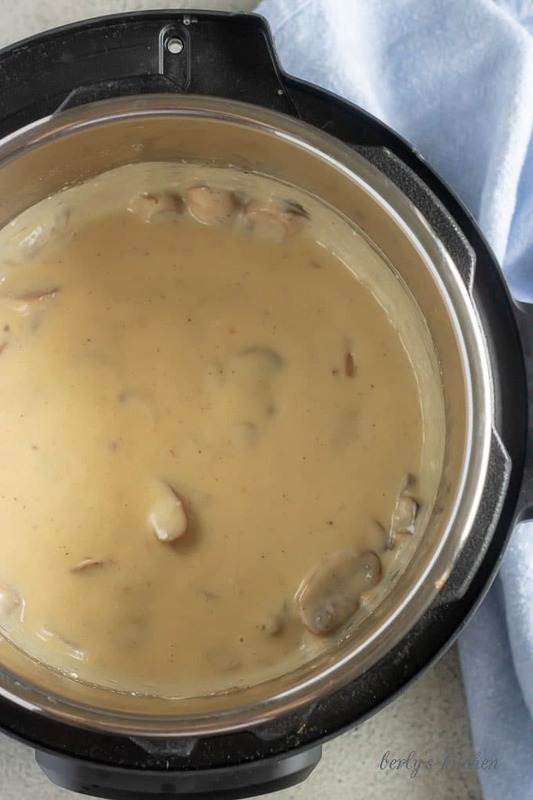 It took a little brainstorming to figure out how to create a creamy mushroom gravy in a pressure cooker. With that being said, we think our method manages to recreate a comforting sauce without the risk of it breaking while the pork chops cook. The end product was exactly what Kim and I wanted for the Instant Pot pork chops. Four, perfectly seasoned, hearty chops smothered in a smooth, mushroom gravy. Well, I use the term gravy loosely here because it’s not a traditional gravy, more like a cream sauce. But, I think it works, and I believe you’ll be satisfied with the flavor and texture. Now, enough talking, it’s time to get down to business. The Instant Pot pork chops do take a little more effort than most Instant Pot recipes, but we think you will enjoy it nonetheless. First, start by turning the Instant Pot to “Saute,” and add either vegetable oil or olive oil. Season both sides of the pork chops with salt and pepper. Then add them to the pot, and cook them for about 3-4 minutes on each side until the chops are lightly browned. If the pork chops are large, work in batches of two at a time. In regards to the oil. When using the Instant Pot, Kim and I generally saute with vegetable oil. For some reason, olive oil tends get too hot, pop, and smoke. That can make sautéing with it a bit too risky for our tastes. Next, remove the Instant Pot pork chops from the pot, and set them aside. Go ahead and keep the Instant Pot on saute, and add the mushrooms and onions. Stir them to combine, and cook everything until the mushrooms begin to soften and the onions start to become translucent. This process usually takes about 5-7 minutes. It’s not a long time, but you’ll want to keep an eye on them while they cook and stir the mixture every few minutes. Then, add the garlic, and let the ingredients cook for an additional 30 seconds. Turn off the saute function, then add the chicken broth. 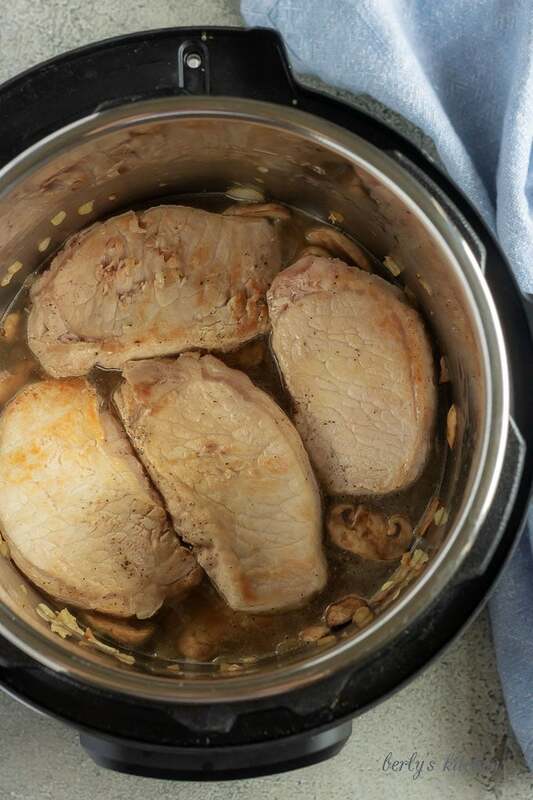 At this point, you should place the pork chops back into the Instant Pot, and close the lid. Set the valve to “Sealing,” and use the manual/pressure cook option to cook the chops on high pressure for 10 minutes. If you think that cook time is little too long, keep in mind you’re cooking pork, so I wouldn’t recommend lowering it. If you choose to do so, then you do it at your own risk. Afterwards, when the Instant pot pork chops have been removed, combine the cornstarch and half and half in a small bowl. Turn the Instant Pot back to “Saute,” and add the cornstarch mixture. Then, stir everything until the gravy begins to thicken. Turn the pot off and add the sour cream, stir once more to mix in the sour cream. Some people may prefer to use a canned condensed soup instead of making the gravy from scratch. However, we prefer the scratch-made version. 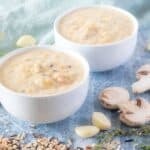 We do have cream of mushroom soup substitute and a cream of chicken soup substitute recipes if you are a fan of soup but may not have a can handy. Last, serve the gravy over the pork chops while the dish is hot. Any leftovers should be stored in the refrigerator, in a sealed container for up 3 days. That’s it your done, well, done with main entre that is. You can serve this dish with Instant Pot mashed potatoes, sautéed green beans, a side salad, you get the idea. Given this is longer recipe, I would recommend cooking some spinach for a side dish. Spinach only takes a few minutes with to cook when sautéed with a little butter and minced garlic. But, feel free to serve it with anything you desire. Let’s take a moment here to address cook times in the Instant Pot. There are a lot of “opinions,” out there concerning meat cook times in the pressure cooker. 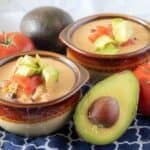 Kim and I use the guide on the Instant Pot website. This handy tool helps us determine how long we set the timer, click this link and see for yourself. Kim chose 10-minutes for safety purposes. I would rather consume fully cooked pork, even at the expense of tenderness. So, if you lower our cook time, you do so at your own risk. If it comes out raw in the middle, that’s on you. Another cooking method we use concerns garlic. A lot of recipes on the internet instruct people to toss in the minced garlic and let it cook for an unreasonable amount of time. At our house, when don’t enjoy overcooked garlic because it becomes bitter. So, always put the garlic in last and let it cook the least amount of time, especially when it’s delicate, minced garlic. The last thing I would like to talk about is pre-seasoning your meats. Again, there are a lot of recipes out there that don’t bother with sprinkling salt and pepper on the meat prior to cooking. That kind of baffles me, because unseasoned meat, in my opinion, is not very tasty. Always, always, always, season the meat before you cook it, even if you’re going to smother it in a sauce. It just makes for a better flavored dish. Need a quick side dish for your Instant Pot pork chops? Then take a look at our Broccoli Bacon Salad or our Jalapeno Cheddar Biscuits! First, turn the Instant Pot to “Saute,” and add the oil. Season both sides of the pork chops with salt and pepper. Then add them to the pot, and cook about 3-4 minutes on each side until lightly browned. If the pork chops are large, work in batches of two. Next, remove the pork chops from the pot, and set aside. 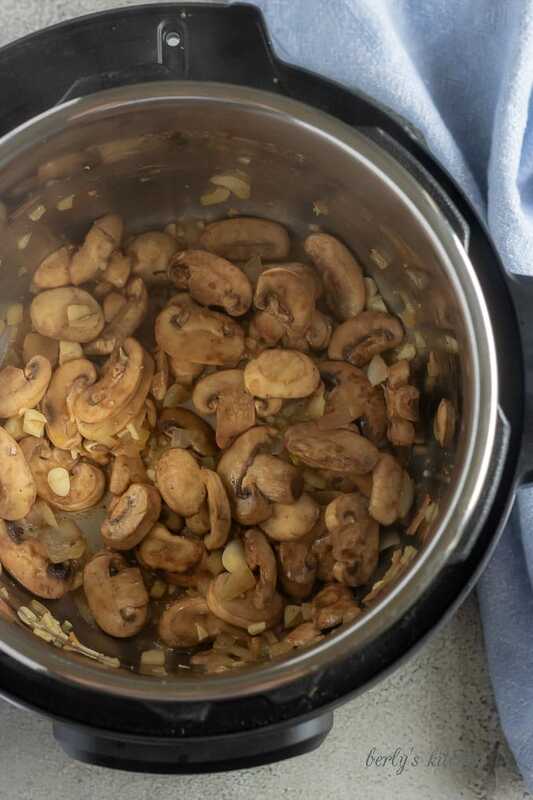 Keep the Instant Pot on saute, and add the mushrooms and onions. Stir to combine, and cook until the mushrooms begin to soften and the onions start to become translucent. This usually takes about 5-7 minutes. Then, add the garlic, and cook an additional 30 seconds. Turn off the saute function, then add the chicken broth. 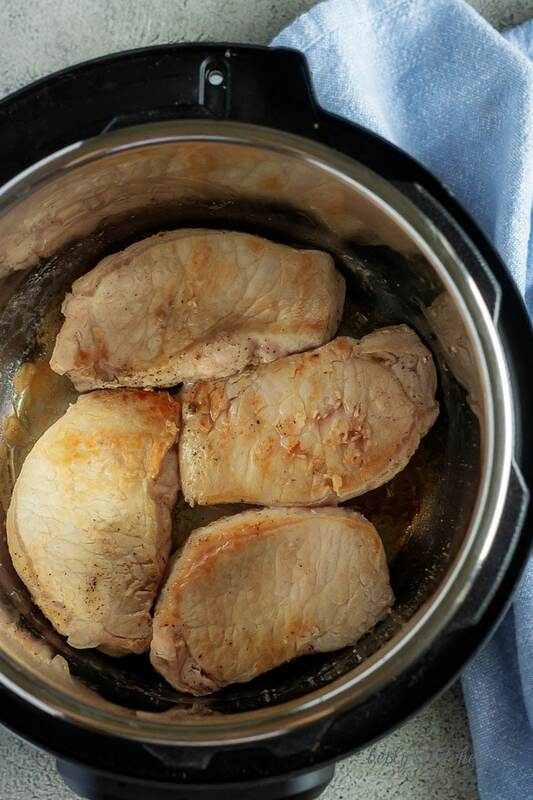 Place the pork chops back into the Instant Pot, and close the lid. Set the valve to “Sealing,” and use the manual/pressure cook option to cook the chops on high pressure for 10 minutes. After the 10 minute pressure cook has finished, allow an additional 10 minute natural release before opening the valve. Remove the pork chops, and set aside. Now, combine the cornstarch and half and half in a small bowl. Turn the Instant Pot back to “Saute,” and add the cornstarch mixture. Stir until the gravy begins to thicken then turn the pot off. 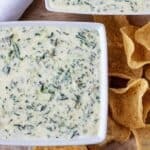 Add the sour cream and stir to combine. Last, serve the gravy over the pork chops while hot. Any leftovers should be stored in the refrigerator for up 3 days. *The calories listed are an approximation based on the ingredients and a serving size of one pork chop and 1/4-portion of the gravy. Actual calories will vary. *The Instant Pot pork chops can be stored in the fridge in a sealed container for up to 3-days. *To make a thicker gravy, use additional cornstarch. For a creamier gravy, add additional sour cream. 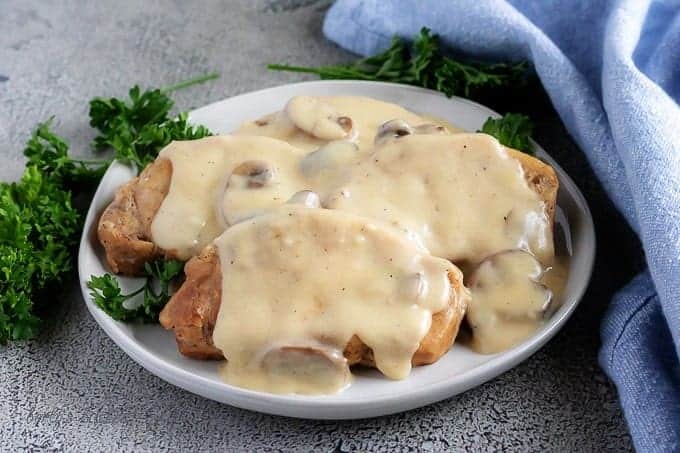 A thicker gravy was used in the photos and a thinner gravy was used for the video. This looks good.. I thought you added a can ofnushroom gravy but you make your own. Can’t wait to try.. ican barely read the writing here so hope it’s ok.